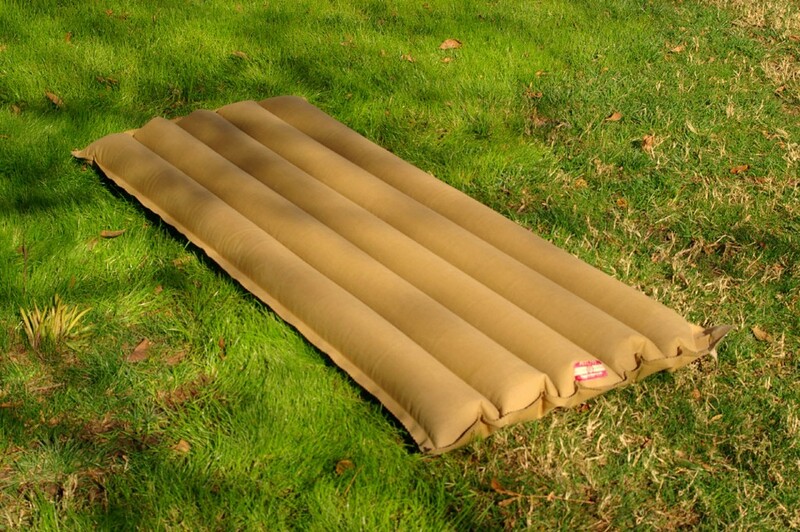 Today, outdoor folk depend on lightweight, efficient mummy shaped sleeping bags for a warm sleep. Today’s mummy bags are truly a marvel. Using high fill-power down, ultralight shell fabrics and advanced construction techniques, these light and lofty calorie trappers weigh less than four pounds and compress smaller than your pillow, yet are comfortable to well below 0°. But what came before the modern mummy bag? How did campers sleep comfortably in frigid conditions during the woodcraft age? 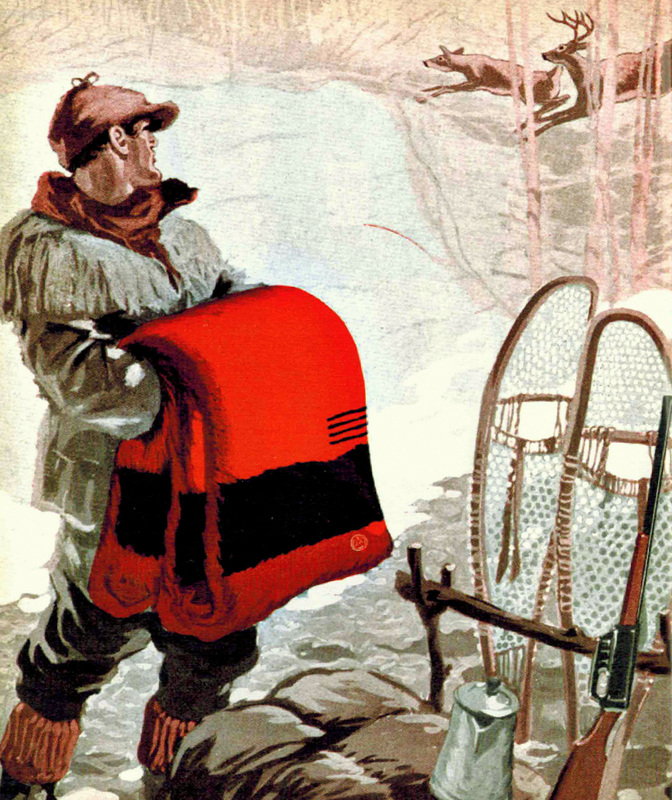 From the first traders to explore the North American continent until after World War II, outdoor folk used wool blankets, the most desirable being the Hudson’s Bay Company Point blanket. Yet, even the wonderful Hudson’s Bay blanket had its limitations. The weight and bulk of blankets necessary to sleep comfortably in frigid weather was excessive. Two blankets were required for camping at around freezing. Much below that and even more blankets were needed. 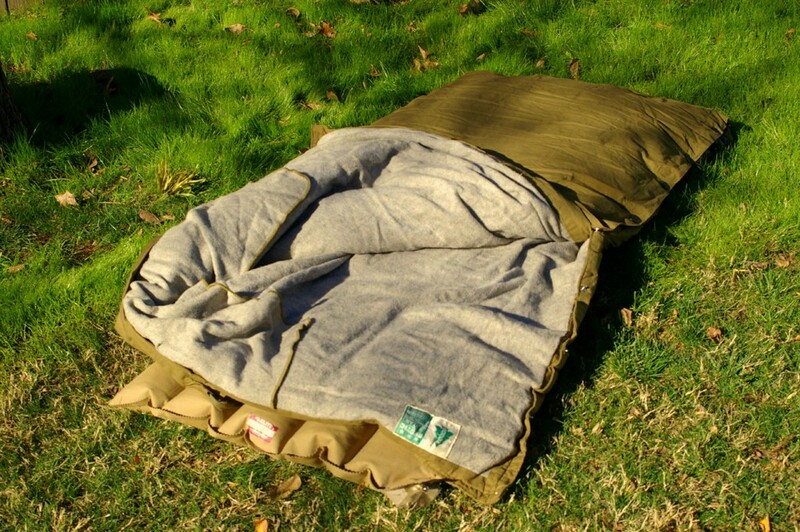 As a single 4-pont blanket weighs a bit over six pounds, you can see that a cold weather setup, even when using the best blanket available, the camper had to deal with quite a bit of weight and bulk. Of course, this problem did not go unnoticed by the old-time experts. Warren H. Miller in particular, was concerned with how to sleep warm using something other than the blanket, devoting an entire chapter of his book Camp Craft to the problem (Ch. 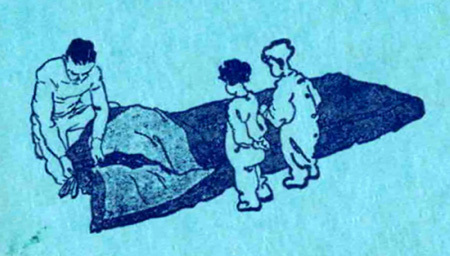 3: Eliminating the Blanket, 1916). Miller was more concerned with the great bulk of trying to pack multiple woolen blankets than weight. He devised a pack bag lined with quilted wool batting that could be laced up into a sleeping bag. Experimenting with various linings including a caribou skin, he found that he could sleep comfortably below 0° at a weight of just above 4 pounds. He and others also described sleeping bags that were recommended or denounced depending on the writer’s experience or biases. All of the early bags were rectangular (like a blanket folded lengthwise) in shape and insulated with layers of blanketing, wool batting or goose feathers. The fill was encased in an envelope that closed with laced grommets, buttons or clasps. There were debates about which insulator was best but no matter the fill, all were relatively bulky and heavy. Nearly all were only moderately successful, most being soon forgotten. However, one particular model captured the market and soon embodied the characteristics the public came to associate with the term “sleeping bag” – the Woods Arctic Eiderdown Sleeping Robe, manufactured by the Woods Manufacturing Company, LTD, of Ottawa, Canada. The Woods Company, founded by James W. Woods in 1885, started out as a canvas products supplier but within a few years had evolved into a manufacturer. Woods produced canvas tents and other canvas goods for prospectors, surveyors, lumbermen, and the military. 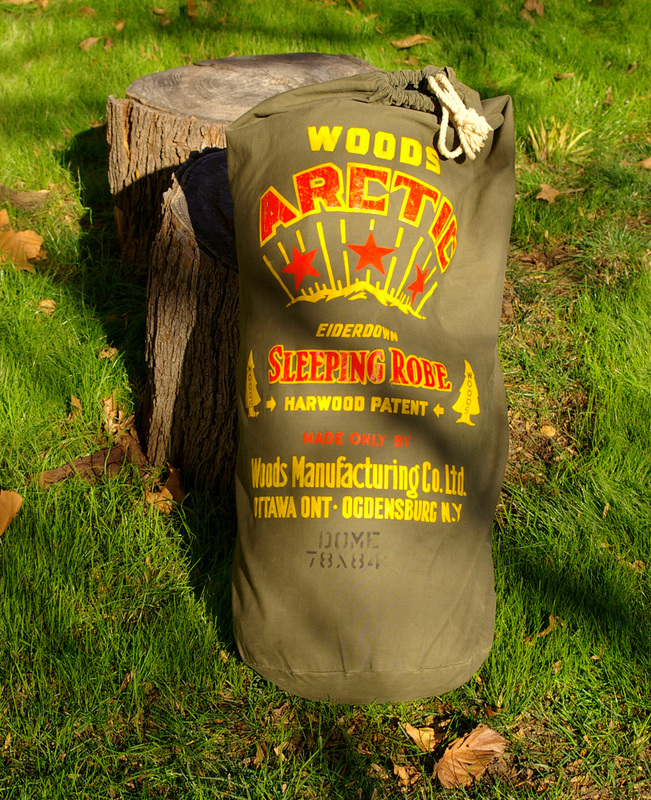 Sometime around 1898, the company introduced a new type of sleeping bag designed for extremely cold weather. Externally, the bag was unremarkable but the insides were a different story. The bag was revolutionary for being the first to use *duck down plumes for the insulation, stabilized with “Harwood patented” internal compartments. The use of some kind of internal compartment to prevent the migration of down continues to be employed today. The Sleeping Robe bag was a 90” x 90” rectangle of tightly woven Egyptian cotton, lined with Kersey wool (later, Junior models with dimensions of 78″ x 84″ and 80″ x 80″ were also offered). 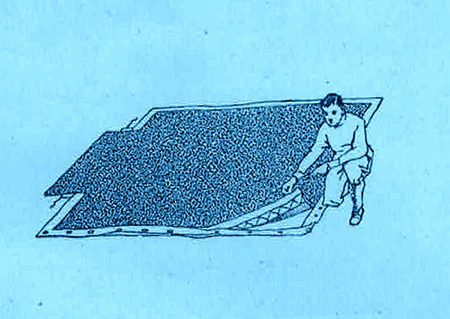 When folded in half lengthwise and secured with snaps, it became a sleeping bag. A flap of wool was sewn to the open end of the bag to protect the head and shoulders of the sleeper. The new bag proved to be warmer and more efficient than blanketing, batting or feathers for the weight carried (6 times warmer than wool, 3 times lighter according to Woods Ltd. advertising). Today, the Woods Arctic Eiderdown Sleeping Robe is generally recognized as the first modern sleeping bag. *The term “Eiderdown” in the product description referred to down plumes being used as opposed to feathers, which were in common use for pillow and mattress stuffing at the time. Woods never used the down plumage of the eider duck. Interestingly, the Arctic Sleeping Robe was not mentioned in the early camping literature. 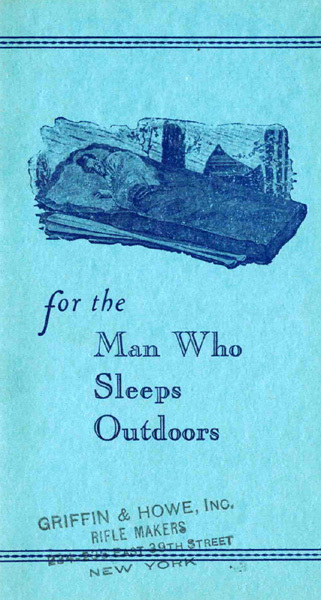 Perhaps it was not known to American camping writers as Woods was a Canadian company. In any event, Americans eventually learned of its existence after the Robe was selected for use by the Amundsen Northwest Passage Expedition (1906) and the Steffansson Canadian Arctic Expedition (1913-1918). 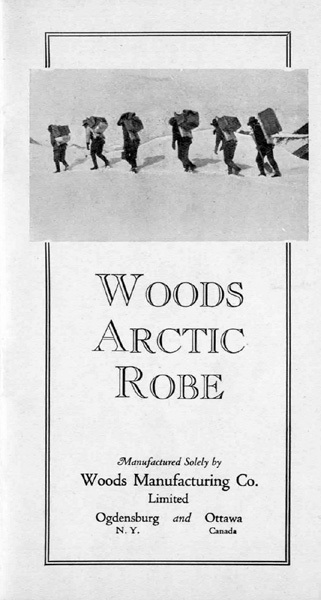 During the 1920’s the Robe was chosen by the American mountaineer and scientist Bradford Washburn for his Yukon Expeditions and was included in the survival equipment carried on the polar flights of U.S. Navy explorer Richard E. Byrd. It was also chosen by members of the Simpson-Roosevelts Field Museum Expedition to Central Asia and the First Canadian ascent of Mount Logan, Canada’s highest peak. With a growing awareness of Woods products in America, Woods opened a factory and sales office in Ogdensburg, NY (most likely to avoid import duty and taxes). By the 1920’s, the Robe was carried by the best sporting goods stores including Abercrombie and Fitch, Griffin and Howe and Von Lengerke & Detmold (of these, only Griffin and Howe survives). These shops served a very wealthy clientele that included Teddy Roosevelt, Ernest Shackleton, Col. Townsend Whelen, Ernest Hemingway, John Steinbeck, Clark Gable and Gary Cooper. The Robe was an ideal product to be carried by these high-end shops. At an average price of $65.00 ($1,101.69 in 2013 dollars! ), it was quite expensive and out of reach for all but the very affluent. 1920’s Woods Sleeping Bag pamphlet from Griffin & Howe, then located at 234 East 39th Street, New York, NY (the shop moved from that location in 1932). 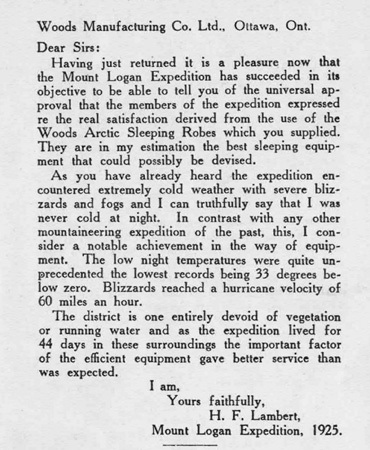 By the 1930’s the Robe was firmly ensconced as the image of a modern expedition “sleeping bag” and was finally described in the outdoor literature when it was recommended by Labrador explorer Dillon Wallace (1863-1939) in “The Campers’ Handbook” (Fleming H. Revell Co., New York, London & Edinburgh, 1936). Wallace noted that the Robe was part of the standard issued equipment carried by the Quebec Forest Rangers. So that’s on your mind too is it? Robert Jordan thought. You’ve a lot of troubles, haven’t you, Pablo? You don’t know why those old eiderdowns cost sixty-five dollars, Robert Jordan thought. I’d like to have a dollar for every time I’ve slept in that thing in the snow. “Then I should sleep in here?” he asked politely. The book also includes a memorable love scene involving the Sleeping Robe but you”ll have to read that for yourself. 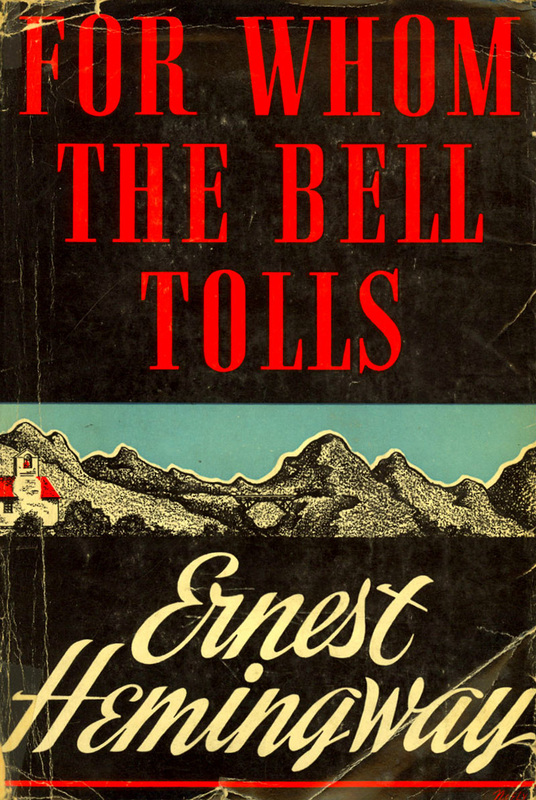 Hemingway made numerous references to the Robe in the book. He was obviously knowledgeable of it. His familiarity with the Robe was due to his owning one, no doubt purchased from one of the great shops described above. 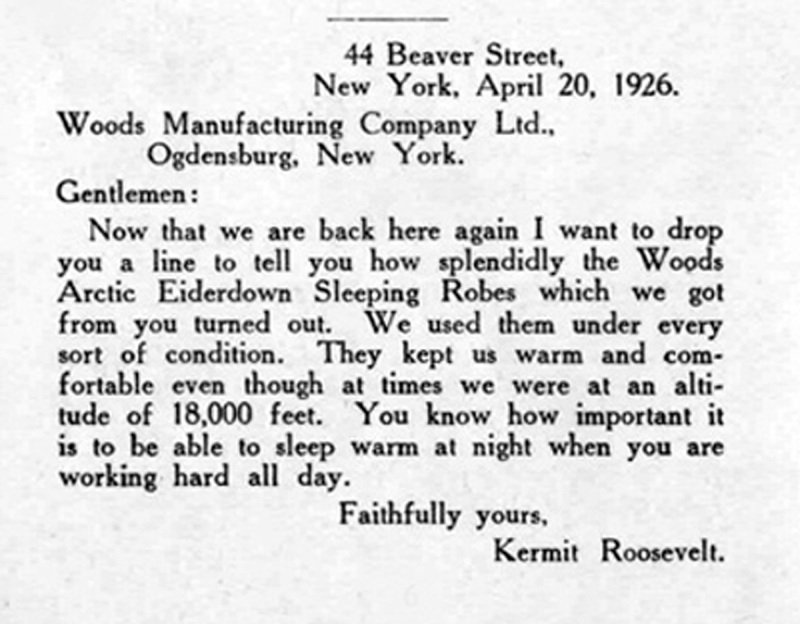 A review of 1930’s era catalog descriptions and prices make it quite likely that Hemingway owned a “Three Star” Arctic Eiderdown Sleeping Robe. The Three Star was the most popular model that Woods offered and retailed for an average price of $65.00 in the 1930’s. The Arctic Sleeping Robe in its duffel bag. WOW! Just look at that logo! The Robe remained essentially unchanged from its inception through the 1960’s when it was updated with newer shell materials and a lighter lining than the Kersey wool. Eventually however, it was surpassed by a new generation of efficient mummy bags. A good mummy bag filled with 3 pounds of 550 fill power down, encased in a nylon shell and closed with a nylon tooth zipper, weighed around 5 lbs. and was as warm as the 16 lb. Sleeping Robe. Mummy bags quickly became the dominant type among serious outdoor folk, relegating the “old-fashioned” rectangular Robe to the “has-been” category. Yet, the Arctic Sleeping Robe remained popular among a small cadre of enthusiasts and incredibly, remained in production along with other very historic Woods products (the #1 and #200 canoe packs and “Prospector” canvas wall tents) until 2008 when the company folded. Today, the Woods name has been revived by Infinity Sports Group of Langley, British Columbia, Canada. The new company brought back the Arctic Sleeping Bag though sadly, the canoe packs and Prospector tents are gone. The latest iteration of the Arctic sleeping bag appears unchanged and prices are actually down from what they were 75 years ago (the current“5-Star” and ”3-Star” Arctic sleeping bags retail for $899.99 and $699.99, respectively). Woods does not state the fill power of the down used in these bags and do not say if the bags are produced domestically or imported. If they are made in Canada, using 600-fill goosedown or better, the price may be about right as the bags are quite large. The “5-Star” in particular is made with two separate quilts filled with 1 3/4 pounds of down and that adds up to the equivalent of purchasing two sleeping bags and their attendant labor and cost. Of course my interest is in the vintage Woods Sleeping Robes fitted with snap closures as they were an important part of the traditional winter campers’ kit, owned by some of the greatest explorers and outdoorsmen of the first half of the 20th Century. And of course, I’ve always wanted to own one. These old Arctic Sleeping Robes go for more than you’d expect. Being the cheapskate that I am, I was willing to wait until an affordable Robe came along. And wait I did! For nearly seven years. Then one day, a co-worker said he’d found an old sleeping bag among his father’s belongings and as I was a camper, would I want it? Sure! No matter what it is or what shape it’s in, I never turn down old camping gear. To my surprise, the bag turned out to be a genuine Woods Arctic Three Star Sleeping Robe fitted with a snap closure! This is the same model owned by Hemingway. My Robe is of ‘50’s or ‘60’s era production, fitted with the poly/cotton canvas shell and closed with rectangular, nickel plated snaps. It is lined with Kersey wool. In most respects, it is nearly identical to those models made at the turn of the century. Sure, I wish it had been made early enough to feature an Egyptian Cotton Shell but considering that it was free, I’m satisfied. Note: The Robe was photographed on a 60+ year old Hodgman PakLite brand canvas air mattress, another wonderful piece of vintage gear. At my age, an air mattress is a necessity for sleeping on the ground and it would be incongruous to pair the Woods Arctic Sleeping Robe with a modern model. For cold weather camping I recommend that you spread a Hudson Bay blanket over the air mattress before placing the sleeping bag on it. 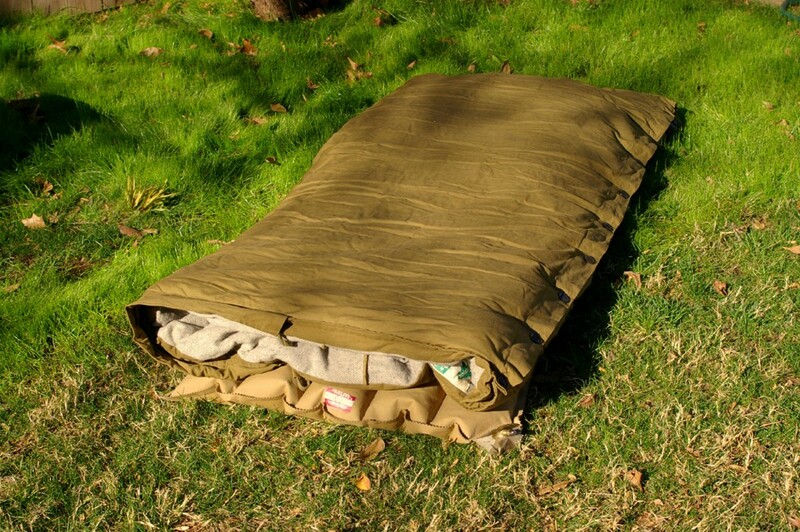 The blanket serves to insulate the sleeping bag from heat loss due to conduction. Note: The mattress was greatly overinflated for photography purposes. If you have the wherewithal to Woodcraft it in winter, then you’d best locate one of these Woods Arctic warmers with haste! Bemiidji Woolen Mills – makers of superb woolen apparel. Little Joe's Boots – the most unique shop in Oklahoma, located in the OKC Stockyards since 1950! Helle Knives – Hand crafted Scandinavian-ground knives that are built to last in Holmedal, Norway. Woods Trekker Blog – The ax and other equipment reviews are very in-depth. Backtracks Primitive Living Skills Conferences – The learning opportunities here are unbelievable! Karamat Wilderness Ways – Primitive Skills and Bushcraft School – All of Mors Kochanski's books and DVDs are available here. Master Woodsman – a lot of great Steven M. Watts articles are posted here! The Schiele Museum of Natural History, Gastonia, NC – "Camping in the Old Style" learning opportunities!